How Far We Have Let America Stray From Freedom When The Government Steals More From Its Citizens Then Crooks! Here’s an interesting factoid about contemporary policing: In 2014, for the first time ever, law enforcement officers took more property from American citizens than burglars did (see chart above). One caveat is that these are only the federal totals and don’t reflect how much property is seized by state and local police each year. Reliable data for all 50 states is unavailable, but the Institute of Justice found that the total asset forfeiture haul for 14 states topped $250 million in 2013. The grand 50-state total would probably be much higher. 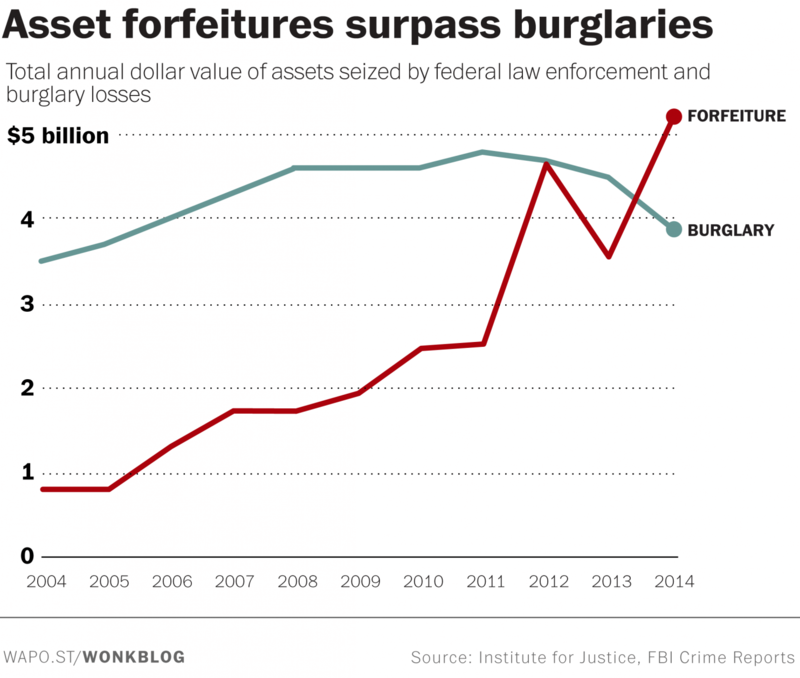 Boil down all the numbers and caveats above and you arrive at a simple fact: In the United States, in 2014, more cash and property transferred hands via civil asset forfeiture than via burglary. That represents something of a sea change in the way police do business — and it’s prompting plenty of scrutiny of the practice. Thanks to some of the scrutiny of the obvious and well-documented abuses of civil asset forfeiture, some lawmakers are taking some much-needed legislative action to curb federal law enforcement agencies’ growing appetite for the legalized theft of private property from innocent Americans. Today, Rep. Jim Sensenbrenner (R-Wis.), along with about a dozen co-sponsors introduced bipartisan legislation to protect Americans’ property rights through civil asset forfeiture reform. The bill is titled the Deterring Undue Enforcement by Protecting Rights of Citizens from Excessive Searches and Seizures (DUE PROCESS) Act, and if passed would enact meaningful reforms to the federal civil asset forfeiture process. Here are links to the press release for the Due Process Act and the full text of the bill. MP: When law enforcement takes more property annually from Americans through a process of legalized theft than burglars take from us illegally, it’s time to stop that abuse of government power. Kudos to the sponsors of the Due Process Act for their efforts to protect innocent Americans from having their property and money wrongfully seized by law enforcement. As Ronald Reagan said once, “Government’s first duty is to protect the people, not ruin their lives.” Through the abuses of civil asset forfeitures, law enforcement agencies have ruined many innocent Americans’ lives. Hopefully some of those abuses will be curtailed with the passage of the Due Process Act.